Seeing that the plot does not support normality, what could I infer about the underlying distribution? It seems to me that a distribution more skewed to the right would be a better fit, is that right? Also, what other conclusions can we draw from the data? If the values lie along a line the distribution has the same shape (up to location and scale) as the theoretical distribution we have supposed. 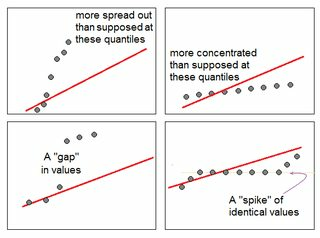 As we see, less concentrated points increase more and more concentrated points than supposed increase less rapidly than an overall linear relation would suggest, and in the extreme cases correspond to a gap in the density of the sample (shows as a near-vertical jump) or a spike of constant values (values aligned horizontally). This allows us to spot a heavy tail or a light tail and hence, skewness greater or smaller than the theoretical distribution, and so on. You may also find the suggestion here useful when trying to decide how much you should worry about a particular amount of curvature or wiggliness. A more suitable guide for interpretation in general would also include displays at smaller and larger sample sizes. I made a shiny app to help interpret normal QQ plot. Try this link. In this app, you can adjust the skewness, tailedness (kurtosis) and modality of data and you can see how the histogram and QQ plot change. 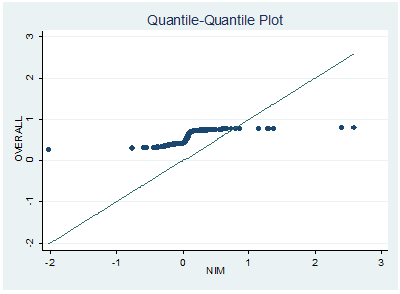 Conversely, you can use it in a way that given the pattern of QQ plot, then check how the skewness etc should be. For further details, see the documentation therein. I realized that I don't have enough free space to provide this app online. As request, I will provide all three code chunks: sample.R, server.R and ui.R here. Those who are interested in running this app may just load these files into Rstudio then run it on your own PC. # Compute the positive part of a real number x, which is $\max(x, 0)$. # This function generates n data points from some unimodal population. # mu: the mode of the population, default value is 0. #           the exact skewness defined in statistics textbook, the default value is 0. #             not the exact kurtosis defined in textbook, the default value is 0. # skewness and tailedness of input. # Keep generating data points until the length of data vector reaches n.
# Deal with the bimodal case. # Need 'ggplot2' package to get a better aesthetic effect. # tailedness and modality. For more information, see the source code in 'sample.R' code. # 'scale' is a parameter that controls the skewness and tailedness. # once to plot two plots. The generated sample was stored in the `data` object to be called later. # For `Unimodal` choice, we fix the mode at 0. # For `Bimodal` choice, we fix the two modes at -2 and 2. # Details will be explained in `sample.R` file. # Overlay the density curve. 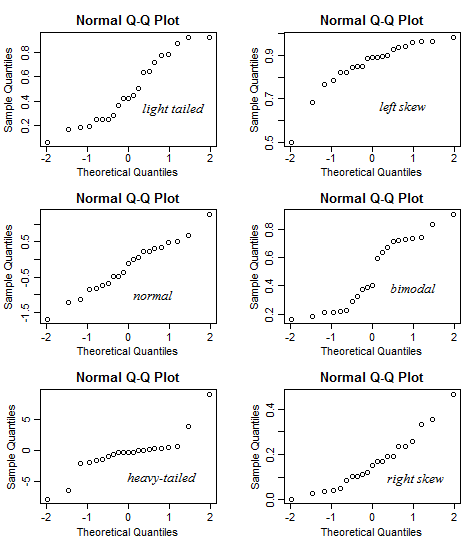 # Plot the QQ plot. 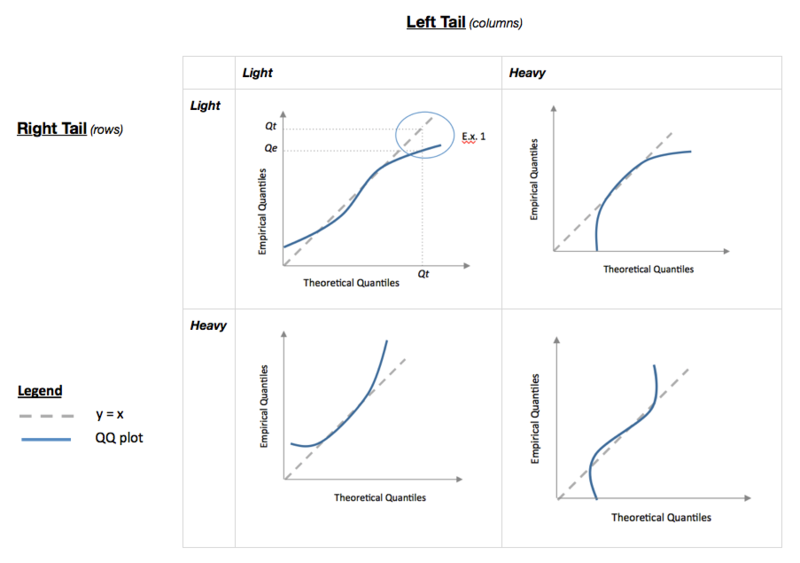 # Define UI for application that helps students interpret the pattern of (normal) QQ plots. # case while "1" indicates the most right-skewed case. # case while "1" indicates the most heavy tail case. # information to help users understand sliders. # bution and the y-axis is the sample quantiles of data. I have crudely copied his diagram which I keep in my notes as I find it very useful. This can be interpreted using the probability density functions. 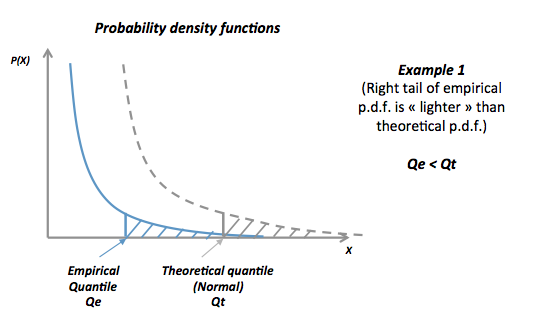 For the same $\alpha$ value, the empirical quantile is to the left of the theoretical quantile, which means that the right tail of the empirical distribution is "lighter" than the right tail of the theoretical distribution, i.e. it falls faster to values close to zero. 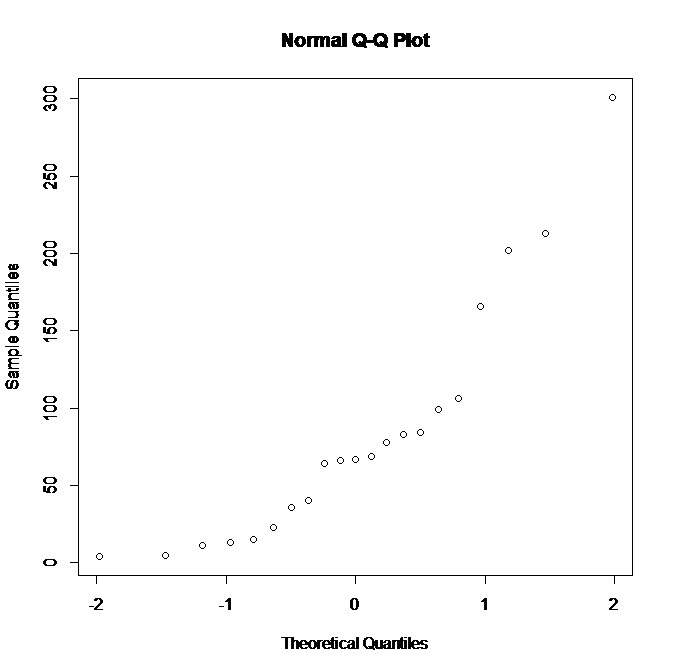 Since this thread has been deemed to be a definitive "how to interpret the normal q-q plot" StackExchange post, I would like to point readers to a nice, precise mathematical relationship between the normal q-q plot and the excess kurtosis statistic. A brief (and too simplified) summary is given as follows (see the link for more precise mathematical statements): You can actually see excess kurtosis in the normal q-q plot as the average distance between the data quantiles and the corresponding theoretical normal quantiles, weighted by distance from data to the mean. Thus, when the absolute values in the tails of the q-q plot generally deviate from the expected normal values greatly in the extreme directions, you have positive excess kurtosis. Because kurtosis is the average of these deviations weighted by distances from the mean, the values near the center of the q-q plot have little impact on kurtosis. Hence, excess kurtosis is not related to the center of the distribution, where the "peak" is. Rather, excess kurtosis is almost entirely determined by the comparison of the tails of the data distribution to the normal distribution. Not the answer you're looking for? Browse other questions tagged r data-visualization inference qq-plot or ask your own question. How do I know what side is skewed? 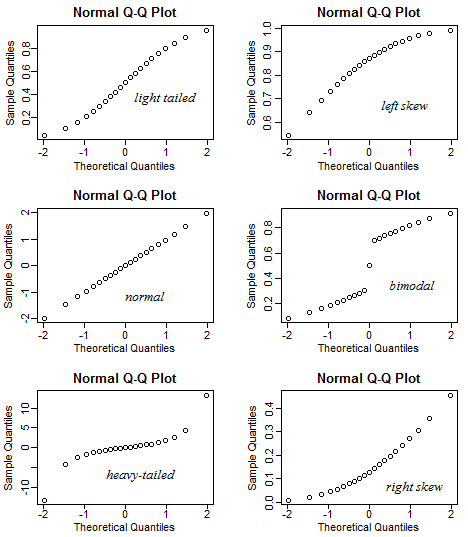 How would you judge this qq plot? Distributional assumptions? Outliers? 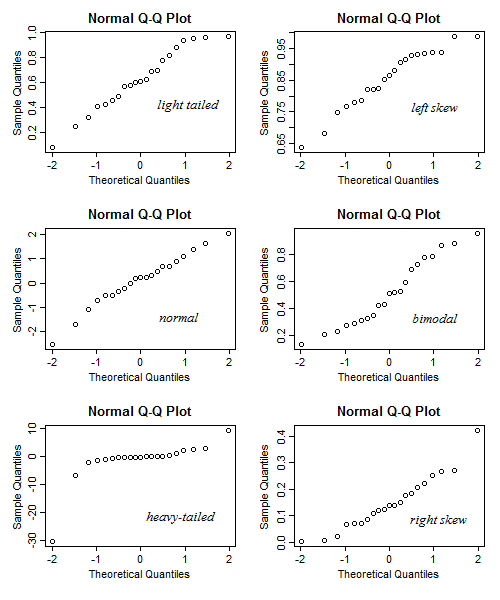 Good explanation of the QQ-plot algorithm? What does this QQplot tell us? Does this normal distribution plot show a good fit? How do I interpret this Weibull plot? What distribution to use for this QQ plot? How to interpret this normal qq-plot?